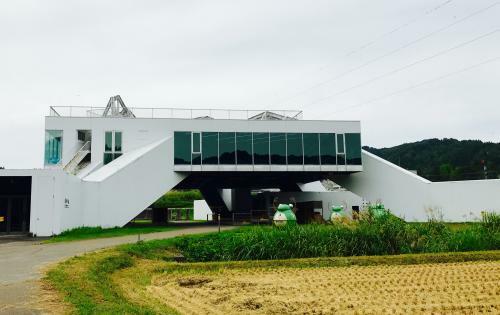 Tokamachi, Niigata, is known for its Echigo-Tsumari Art Field. 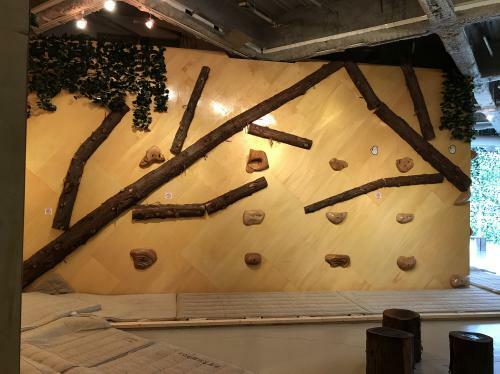 Being the pioneer of outdoor art festivals, which have now become popular in other parts of Japan, the Art Field started as an effort to revitalize the community in 2000 and has continued since. The art festival, which is held every three years in the summer, is due to take place in 2018. Here are some of the food spots where mouth-watering vegetarian lunch is served during your tour around the artworks. 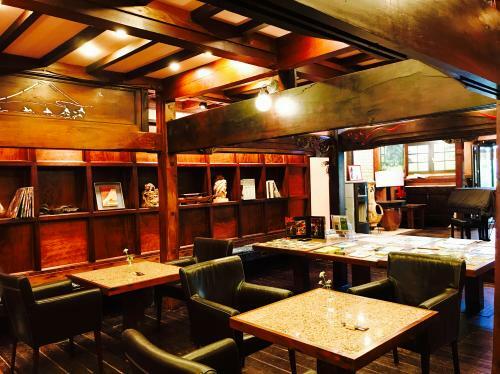 Situated in Matsudai Station, just one stop Naoe-bound from Tokamachi City of Niigata Prefecture on the Hokuhoku Line, is a restaurant where visitors can enjoy vegetarian meals as they go around and observe the artworks scattered throughout the vast satoyama (hilly countryside) community. It is a wonderful place where you can enjoy both the arts and food of the autumn season as you enjoy lunchtime while observing the works of art! ”No” comes from nogyo, or farming, so No-Butai (Butai = Stage) is a very fitting name for the rice-growing region. Clever, don’t you think? The building itself is an artwork in itself! 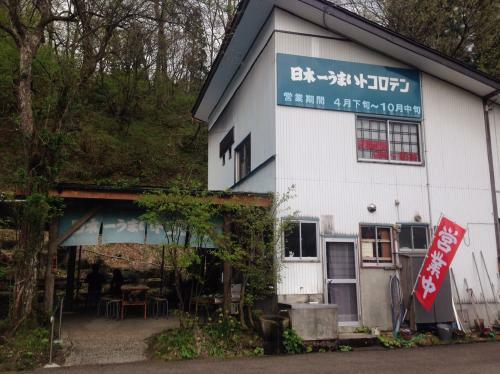 Inside this building is the highly recommended Satoyama Shokudo! 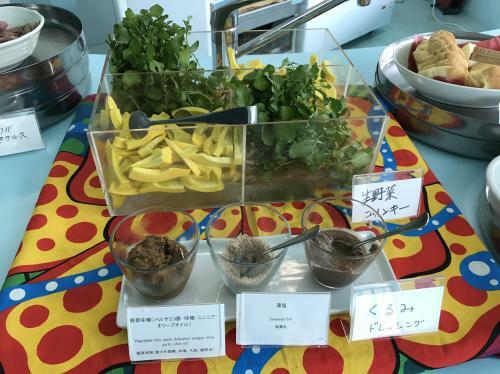 Set meals are served on the weekdays, but on the weekends and public holidays, they offer a healthy and delicious lunch buffet featuring locally produced vegetables at only 1,500 yen (plus tax), making the restaurant a very popular destination. 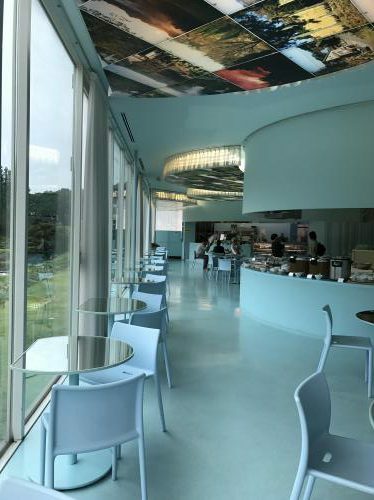 Large windows line the entrance, and from any of the tables by these windows, visitors can observe the gentle river along with the nature and artworks of the satoyama. It is a very scenic restaurant. The spacious restaurant accented with a soft shade of light blue offers a very bright and comfortable space, brimming with the sense of expansiveness. At Satoyama Shokudo, you’ll not only be served a variety of delis created mainly with the fresh local vegetables, but also rare vegetables and local specialties that are only available in this region. Around 20 types of various dishes are offered on the big counter table. It is especially great for health-conscious eaters who want to try a little bit of everything! This is the set meal served on the weekdays. Notice the hearty size of this meal! Even the placemat on the counter featured a design by Yayoi Kusama, and we were very thrilled with the artistic vibe of the place. The dishes served will change from day to day, so it is advisable for vegans and vegetarians to inquire about the cooking methods and seasonings contained in the deli dishes. For non-vegans and non-vegetarians, there are more options such as fried chicken and gapao with ground meat. 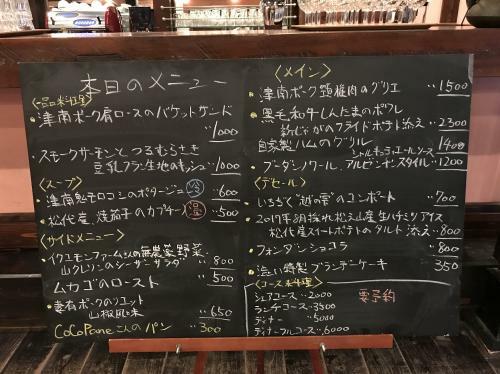 Once you have finished your meal, you’ll have a choice of drinks including wholesome options like dandelion coffee and sannen bancha (sannen=3 years, bancha=type of Japanese green tea). There were over 10 kinds of deli dishes with free helpings for seconds, of course. The square dish held the dessert, which was apple cake (contains eggs). 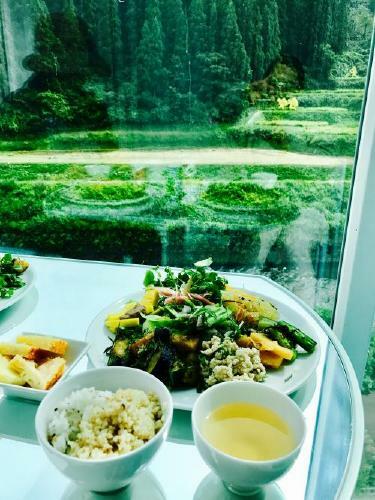 A leisurely meal while enjoying the view of the art dotted across the terraced rice fields will surely refresh your soul and body. 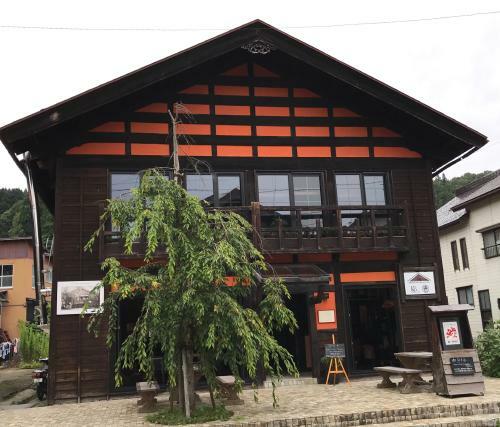 Other than dining, the building is also equipped with a bouldering space for children to play, a staff to guide you through the trekking courses in the satoyama, and a store where you can purchase a variety of goods. Next, we will introduce Shibui, a restaurant situated in a renovated traditional Japanese house revived by the German architect, Karl Bengs. Karl Bengs, a German architectural designer, fell in love with the beautiful nature of Tokamachi and settled there. Shibui is situated in the area where his revival of old private houses project took place. It is a gorgeous restaurant in the former Matsuei-kan, a long-established ryokan (Japanese inn), which Karl bought and revived! Inside the establishment is a spacious room fitted with tables. 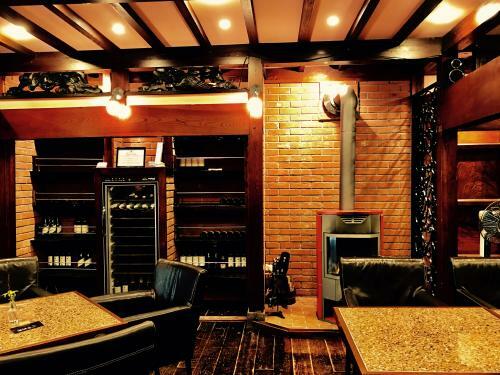 The interior is decorated with a well-balanced mixture of the old and the contemporary, allowing the patrons to spend time in peace and serenity. The striking stove (pictured above) highlights the room. During the winter season, the region will be piled with up to three meters of snow, so the warm fire will surely be welcomed. There are stoves available for purchase as well! You’ll have a choice of a course or an a la carte menu. Vegan and vegetarian options are available, so please make your request at the time of the reservation. Highly recommended is the quiche! This is a very popular menu, so it is advisable to make lunch reservations. 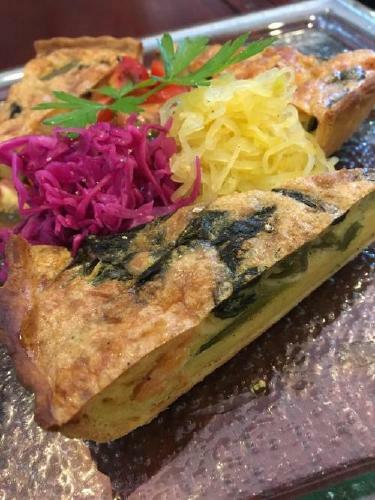 *The quiche is offered for lunch, but they can be made available for dinner upon request at the time of the reservation. 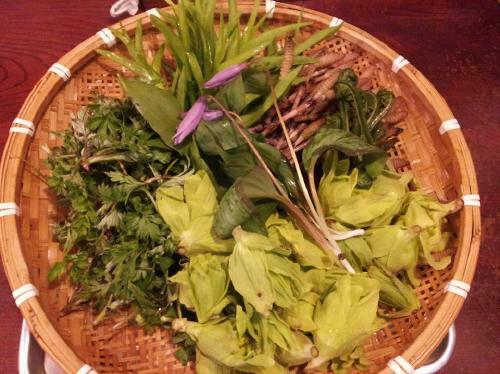 Sansai (literally, mountain vegetables) cuisine is available in the spring season. 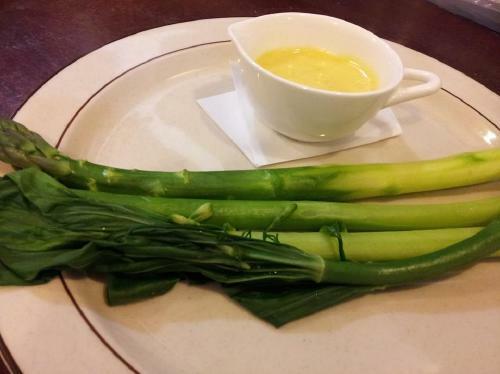 Here’s to the asparagus lovers out there! Mouthwatering mushroom dishes will be available in the season to come. *The pizza pictured above is a seasonal offering. 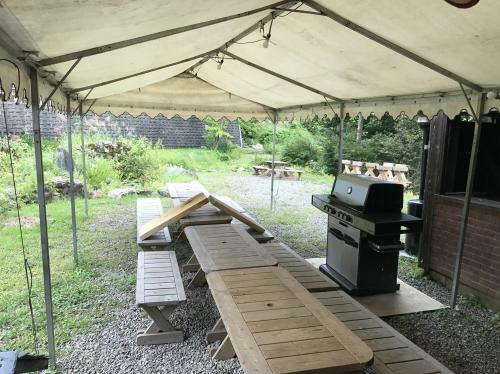 The restaurant boasts a spacious backyard where barbeques are frequently held! This can also be reserved. How about a vegetarian party with your jolly friends? A la carte menu for lunch is written on the board. 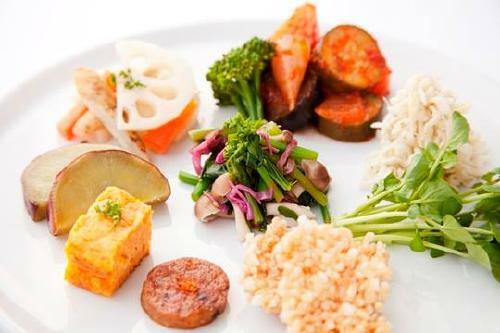 The main dishes are meat and fish, but the vegetables are all pesticide free. With the exception of reserved tables, only the bread plate is available on Tuesdays; however, on other days, the restaurant is open for lunch and dinner courses, as well as teatime. “Please make your vegan meal requests at the time of the reservation. We will answer to all of your needs. Please reserve your preferred course and a la carte dishes, including desserts, at least three days in advance. 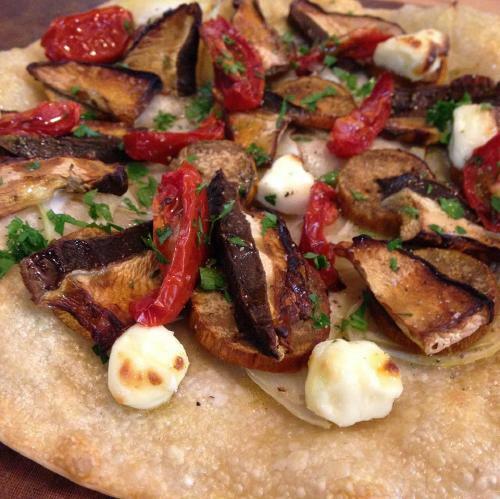 Vegetarian requests can be made one day prior,” says the head chef. The exquisite ambience of the establishment is often chosen for wedding ceremonies and evening concerts on the grand piano. 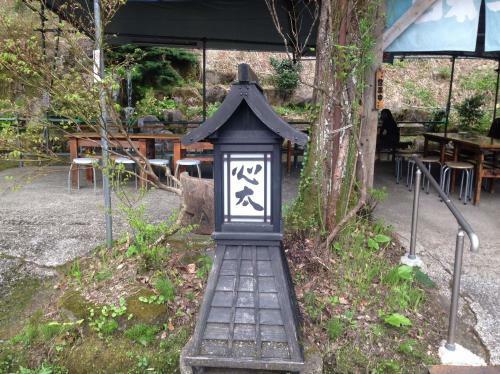 Why not relax and appreciate the time as it slowly passes in the satoyama. 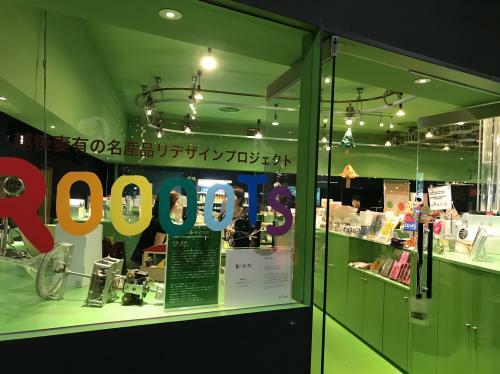 Next up we’ll give you the information on the best tokoroten (jelly noodles made of seaweed) in Japan, located near Hokuhoku Oshima Station just next to Matsudai Station. We have a weakness for anything declared as Japan’s best! The best tokoroten in Japan is made with natural tengusa (Japanese native seaweed) and pure spring water and contains absolutely no additives. 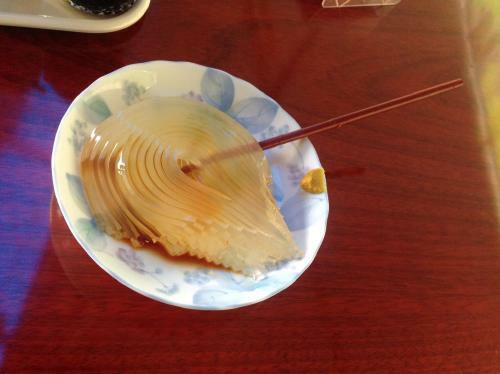 It has a firm texture with much bounce, a famed characteristic which allows the noodles to be picked up with only one chopstick, and you’ll only be given a single chopstick for eating. This is a way for the shop to let patrons know that their tokoroten won’t break up into pieces even when eaten with one chopstick. You can also take home freshly made tokoroten as well! Unfortunately, they are closed during this season, but do make it a point to visit when they are open! ※This shop is closed from October to April.